Dec. 15, 2014, 2:58 p.m. Dec. 15, 2014, 2:58 p.m.
Oliver Pazio, Insurance Revolution analyst; Mark Rigby, Insurance Revolution head operating officer; Paul Dunn, company director and Paul Chambers, Well Dunn team leader, outside the Wood Street Mission building. Generous insurance brokers have shown that Christmas really is the time for giving – by donating their festive bonuses to a Manchester charity. Staff at Insurance Revolution all agreed they would rather give their December bonuses to a good cause, rather than take it themselves. And as the firm’s director, Paul Dunn, was so impressed with his employees’ altruistic gesture, he agreed to round the total figure up to £3,000. 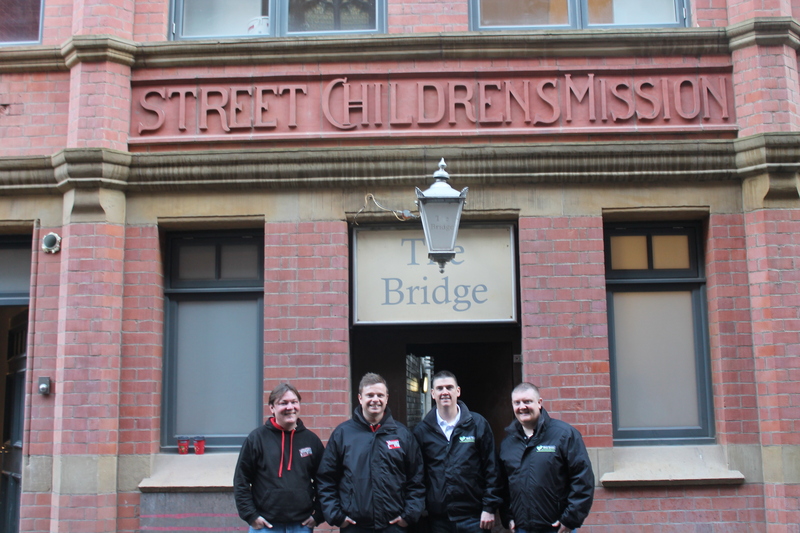 The money has been donated to the Wood Street Mission, a charity which has been working to alleviate poverty in Manchester and Salford since 1869. 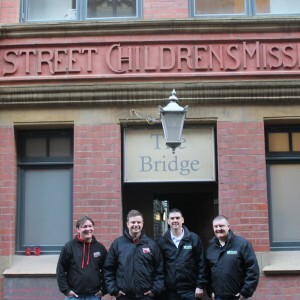 Wood Street Mission runs projects throughout the year, but at Christmas it organises a huge drive to provide toys for underprivileged children, to ensure that any child affected by poverty has a new present to open on Christmas day. The charity also provides food hampers to the family of every child it helps, to ease some of the financial strain parents face during the festive period. Insurance Revolution’s Oliver Pazio helping to distribute toys. The money donated by Insurance Revolution, which is a trading style of Well Dunn Ltd, has been used to buy new toys, which some team members helped to distribute at the charity’s Wood Street base on December 15th. Paul said: “I’m so proud of the team. They came up with the concept completely off their own backs, which I think is commendable as everyone is more financially pressured at Christmas. Last year more than 4,500 children received toys from Wood Street Mission and this year it hopes to help even more. Wood Street Mission chief executive, Roseanne Sweeney, said: “We are delighted that staff from Well Dunn Insurance and Insurance Revolution have donated their Christmas bonuses to our appeal. “£3,000 is enough to make a difference to the lives of a lot of local families living on low incomes this Christmas. 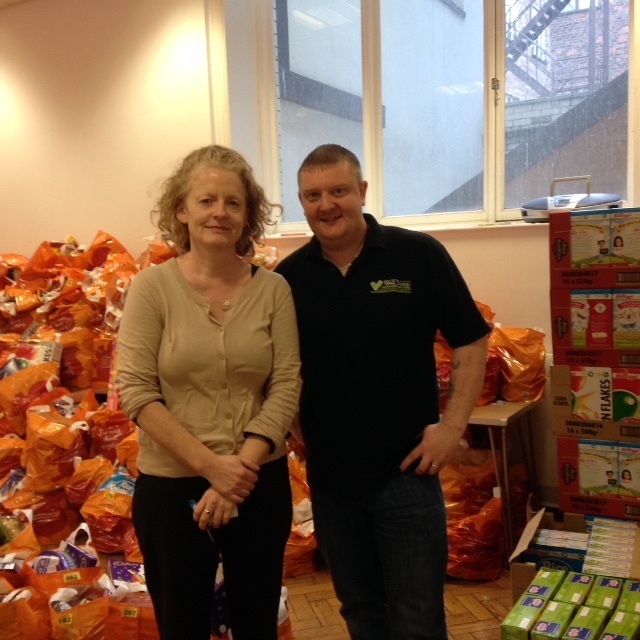 Insurance Revolution head operating officer, Mark Rigby, said: “The team really enjoyed helping out at the Wood Street Mission distribution day. “It was really worthwhile to see where our money is going and to witness firsthand how hard the Wood Street Mission staff work.